This tutorial was requested by Wendy Nelson. Thanks Wendy! Do the same thing for the top section of the face. These lines are for the eyes, nose, lips and hair. I like to draw the top hairline between these 2 lines. 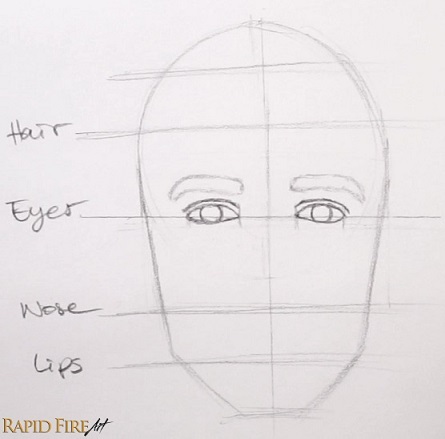 Roughly between the eyes and nose, draw the ears. Do the same thing for the top section of the head. Draw your eyes in the 2nd and 4th space. 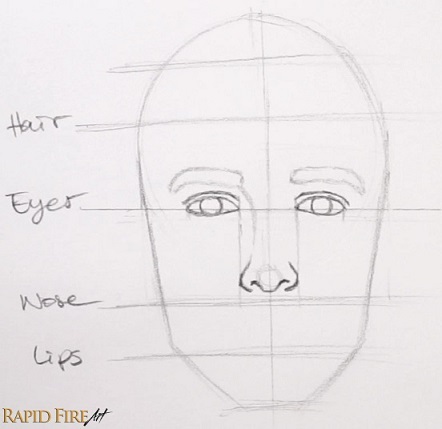 Draw the ears roughly in between the eye and nose line. Drawing narrow eyes can make a face look more chill and relaxed. The more visible the iris is, the more alert, intense, surprised, innocent or even angry the face will look. Try different eye shapes too. I tried to make him look southeast asian by turning his eyes up at the ends, making the tip of the nose less pointy and giving him a pair of well defined lips. Try to turn your character from a man into a boy by simply making his jawline narrower and smoother so his bones look less developed. The original face looked sad. When I made her eyes wider, her sadness disappeared instantly! I didn’t even need to change the eyebrows. And then I changed her lips and lowered her nose. Thanks for this article. This is one of THE BEST websites I have found. thanks a lot for this lesson…it was awesome.You made one of wishes come true…I really appreciate that. You are perfect,Thanks a million for everything. I am a artist, but I tried facial drawings for the #1 time. I have to agree you guys helped me a lot. I hope I’ll be very good some day but for now give us more tutorials. Amazing tutorial, thankyou so much.. complete beginner..
can you please make more art faces? THANK YOU THANK YOU THAAAAAAAAANNNNNNNNNK YYYOOOOOOOUUUUUUUU!!!!!!! This is so awesome. It has taught me so much, thanks! Have you done a tutorial for drawing young kids and babies? Thank you so much for this tutorial! This is the best one that I found yet! 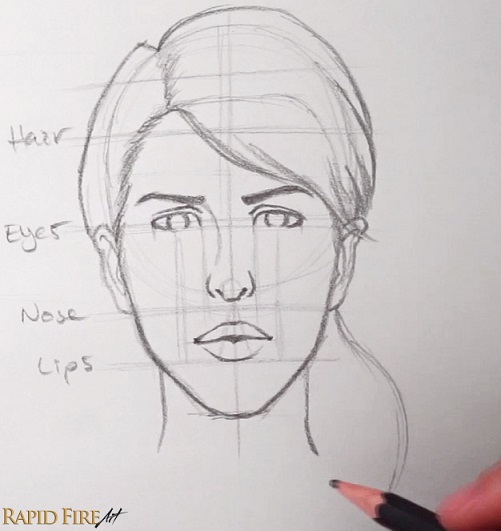 I am a 14-year-old beginning artist and this tutorial really deepened my understanding of facial drawing. Before I read this tutorial, all my faces came out looking weird, but now, they are coming out so much better! I was even able to draw a decent looking sketch of Celine Dion. Thank you again for this tutorial!!! OMG this was amazing, mine came out almost like yours and it didn’t take long either, and so simple I love it!! Thank you for doing tutorials before i hated drawing now i love it :) ! Looks good – I will start again at the beginning – what is the finger glove for? Darlene… Thank you so much for your tutorials. I was about to give up on my drawing thinking I was going nowhere but your simple to follow teaching has brought me on no end. Keep up the good work. Jez. plz suggest me the ways to draw both front and side view of same person. so plz tell me some logistics tricks plz..
Mam can u make a video how to draw portrait of someone. Pls pls pls its a humble request. thank you soo much for helping me darlene…..i am so pleased to find this website and it is also my honor to always come to this website i am senofoni from tonga my aunt died but you look like her and it feels like it is her who is teaching me art hahahaha….but anyways thanks for your hardwork…..may the lord give you more strength and wisdom for your drawings!!!! Aw thank you Senofoni! And welcome to the RFA family!! I do have a question however… Would you mind adding some tutorials on how to draw faces of different ethnicities? Really helpful – I am a complete beginner and this is demystifying everything for me. Thanku so much for giving a exclusive knowledge freely and in more simple method. I love love LOVE your teaching style, it’s very helpful, but (There always is one isn’t one isn’t there. :D) I’ve been having trouble with basic anatomy for humans. Do you know if you could do a tutorial from that? I would love it if you could do a tutorial on clothes! And tips on how to draw from references, this tutorial was very helpful though thank you! Darlene, thank you so much for making tutorials I can understand, my entire art class uses your website and we find it very helpful with our current project! We love what you do and on behalf of my entire art class I say thank you! Wow, really?! That is so cool, William! I’m so happy to hear that. Tell everyone I said hi :D Also, if there’s a topic you want to teach your students but can’t find it on the site, let me know and I’ll see what I can do! Your tutorials are cool and really helpful. Darlene thanks for your teaching. I want to learn with you, but I do not know entglish. I will try . Thanks so much Darlene. After practicing and doing other online and book study for drawing on & off for about 5 years and still struggling this was exactly what I needed. Your tutorial was so simple & easy to understand and it gave me immediate improved results. I am forgetting all the other tutorials out there and sticking with you. This was the first tutorial I did of yours and loved it. 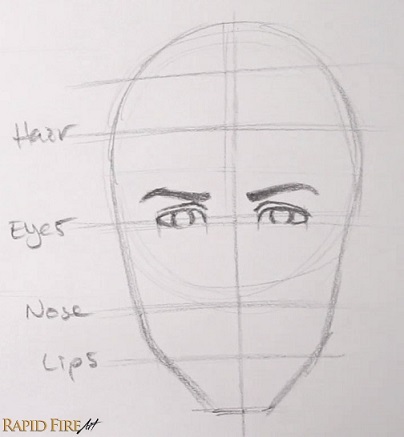 I will be doing your other tutorials on the eyes, nose, mouth then signing up for the shading tutorials. Thanks again and keep up the great work!!! Thanks Bob! I appreciate your support and love your enthusiasm for drawing! Welcome to RFA and don’t hesitate to contact me if you have any questions! Thank you. Yes I considered making my own stamps as I am a bit of a geek and can’t find stamps of images I have in mind. So if I can’t find it then why not make them? ( oh right, drawing them is still an issue ;) ) Also why I searched for tutorials. The patronage is not much but can’t spare more at the moment. It’s a start. And again, without these quality free tutorials I would be getting nowhere. Thankyou for being very clear in your insructions. Keeping the measurements in mind is the biggest problem, especially when starting. The measurement part is the most tedious and important. It’s always a good idea to double check your measurements after each step. Thank you Darlene. My name is Terry and I’ve never drawn in my life but, after watching YOUR tutorial YOU really make it look easy for a beginner like myself. I TRULY believe that this tutorial WITH plenty of practice will get me into the school of my dreams to become a fashion designer. Have you made any tutorials on sketching fashion figures or how to create the perfect portfolio and mood board? Thanks again. GOD BLESS YOU. Thank you for such wonderful, well thought out, in-depth tutorials. I have learned so much from them for both traditional and digital art. This one was especially useful. Simply amazing and thank you just doesn’t seem like enough. You’re such a sweetheart Jules! Thank you, this looks great! My hobby is cardmaking, and as I can’t draw I use stamps (also it’s a lot faster – I love playing with ink). I have a rather large stamp of a young man, it’s a great stamp. And then my interest for drawing myself surfaced again… I wanted to make him look older. Like a real experienced traveller. (It’s the Sheena Douglass Time Traveller Steampunk Man in case you’re wondering). He looked to neat to be a traveller. I came a way with colouring but not good enough. And then I tried drawing myself. Figured I’d start with the eyes, and they were not that hard to draw (or rather, with limited practice the result looks ok when I follow your tutorial! So with more practice…). Still need to continue… This tutorial gives me motivation again to keep going. If you’re out of ideas for tutorials (and if you don’t have it yet, didn’t check again but don’t remember having seen it on the site), then maybe a “roughening” tutorial? – aging, some bruises or dirt, paint, scars maybe…(Probably a more advanced drawing tutorial?). Love that you share this so openly. That’s so cool Debbie! Have you considered making your own stamps? That would be a super fun project. By the way, thank you so much for your patronage!! You’re so sweet! Wonderful! Hope I’ll be able to draw like this soon. Thanks for sharing! Thank you Lisa :) Feel free to contact me if you need any constructive feedback. I’m more than happy to help! Wow. Extremely helpful. Thank you. Thanks Bernard! I’m so happy to hear that! !